All your Net Promoter Score data will be processed and displayed on the Dashboard. By default, the Dashboard includes your all time NPS data, collected from all customers in your account. You can use the Dashboard filters to segment NPS data by specific campaigns, customer and response segments, date range, etc. In this article, we will talk about each data block on the Dashboard and cover some frequently asked questions to help you get familiar with and make it an indispensable tool in your business. Beware, the results on the Dashboard might be cached for up to 10 minutes, to serve the data faster. The first data block on your Dashboard contains general information based on your NPS campaigns. Here you will find your overall NPS score, and if you click on the tooltip next to the score you can see how it was calculated. Besides the score, you have the number of Promoters, Passives, and Detractors among your respondents, which were used to calculate the Net Promoter Score. The Dashboard is pre-set in the auto-refresh mode, which means that every time you receive a new response, your NPS score will be automatically updated accordingly, along with all the other data blocks on the page. You can switch to a static Dashboard by clicking on the auto-refresh button in the right corner of the general Stats block. Even though the Dashboard filter option is part of the General stats block, it deserves its own chapter, since it affects all the data on the Dashboard. Date range: You have a few preset options, or you can select a custom time range. Campaigns: This filter basically turns your Dashboard into a campaign’s reports page. The stats blocks will display only the data obtained from the selected NPS campaign. Customer tags: Select one or more customer tags to narrow down your audience to a specific segment. Response tags: Select one or more response tags to view NPS data based on specific feedback topics. The Latest Responses block gives you a quick preview of five most recent NPS scores and feedback you have received from your customers. You can also filter the latest responses by respondents’ category: Promoters, Passives or Detractors. The Latest Responses block will display data based on your Dashboard filters (if any are applied). To view all responses you can either click on the View All link or access the Responses page. The Response Tag Analysis report shows what are the most used response tags and their distribution over Promoters/Passives/Detractors. This information will help you identify certain customer experience patterns, such as what Promoters are mostly delighted about, or what’s keeping Detractors unsatisfied. The report lists all tags that have been applied to customer responses. They are ordered descending by their frequency amongst responses, therefore, the most frequent tag will be on the top. Next to each tag, you have a counter bar, displaying the total number of Promoters (green), Passives (yellow) and Detractors (red) responses which have the tag applied. You can easily filter out a customer category by clicking on the Promoters, Passives or Detractors buttons from the top of the Response Tag Analysis block. The tag report is also directly connected to the Dashboard filters, and the changes you apply there will be reflected in the report as well. Besides knowing your current NPS score, it’s highly important to know how your score changed over time, which will help you understand whether your customers’ satisfaction has improved, or on the contrary. Use NPS trend graph to check on your score’s dynamics during a specific date range. Click on any day icon in the graph to view how many Promoters, Passives, and Detractors you had on that day. The Net Promoter Score trend graph is connected with the Dashboard filter which comes in handy if you’d like to check the score dynamic of a specific customer segment, in a given date range. Response rate: The total percentage of received responses (opened and scored). Sent: The number of surveys that got sent to customers. Delivered: The number of surveys that were delivered successfully to customers. Opened: The number of surveys that were opened by your customers. Scored: The number of surveys that have received, at least, the score. Responded: The number of surveys that have received text-feedback. Unsubscribed: The number of customers that have unsubscribed from your surveys. Bounced: The number of surveys that have bounced (hard-bounced customers are marked automatically as unsubscribed and our system will never survey them again). Beneath each integer number, you will find it’s percentage. Also, you can click on a number’s label to access the filtered Customers page and view the customers that match the chosen delivery status. 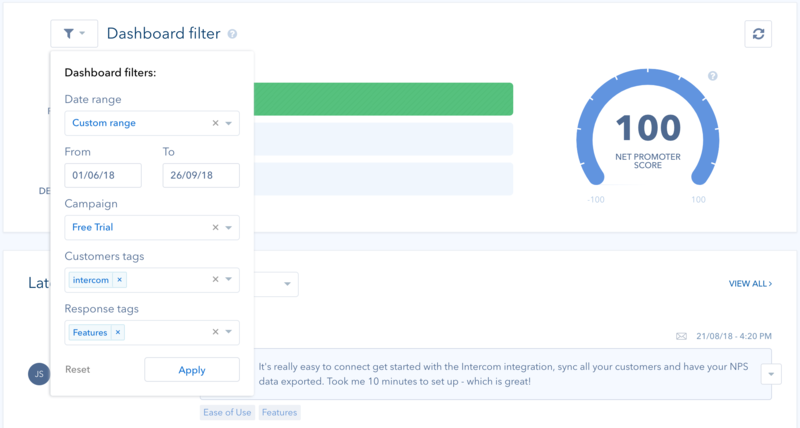 The Delivery Stats block is also connected to the Dashboard Filter, which helps you view the delivery stats for a specific segment of customers, within an NPS campaign in a given date range.